Kantoku Teruya (third from left) and other diet members from Okinawa constituencies released a statement demanding the immediate release of Hiroji Yamashiro, director of the Okinawa Peace Movement Center, who has been detained by police for about four months, on the afternoon of February 18 at the Okinawa Prefectural Office. 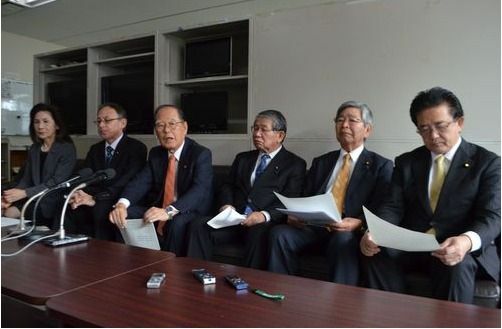 At a press conference held on February 18 at Okinawa Prefectural Government Office, six diet members from Okinawa constituencies released a statement demanding the immediate release of Hiroji Yamashiro, director of the Okinawa Peace Movement Center. Yamashiro has been detained for about four months after being arrested and prosecuted on a charge of alleged forcible obstruction of business while protesting against the construction of Helipads in U.S. Northern Training Area in Takae, Higashi and new U.S. base in Henoko, Nago. Kantoku Teruya, Toshinobu Nakazato, Seiken Akamine and Denny Tamaki, members of the House Representatives, and Keiko Itokazu and Yoichi Iha, members of the House of Councilors, issued the statement in their names. They criticized the Japanese Government and asked for the immediate release of Yamashiro. According to the diet members, Yamashiro is focused on maintaining good health for the first court hearing, which is set for March 17.